Thanks, Cee this was such a pretty place to visit. LOVE the backdrop of mountains over the water! This lake is absolutely amazing, Nancy and one of our second day stops in the Olympic National Park. It was carved by glaciers 7 thousand years ago and the water is a stunning crystal clear blue/green. How awesome! And now I’m itching to visit the PNW. Oregon has been on my list for a while now, but I’m thinking a road trip starting in Vancouver with a lot of side trips would be fantastic! You’ve plenty on your plate, Nancy. I’m getting tired just thinking of your projects! Since it is part of the NP I guess there are no cottages on shores. Shame, I was thinking of buying one 😉 I love your sparkly water surface, Lisa! How fortunate, but still out of my way 😉 Thanks, Lisa. Another place we’d never heard of before that we want to see again, for longer! All my photos of it are from the bus – with Bryan telling me when to click between trees, and nowhere near as good as this – beautiful! I kept trying to get a good shot from the car but couldn’t make it work. Fortunately we found a great place to pull over. 🙂 I hope you get your wish of a return visit! 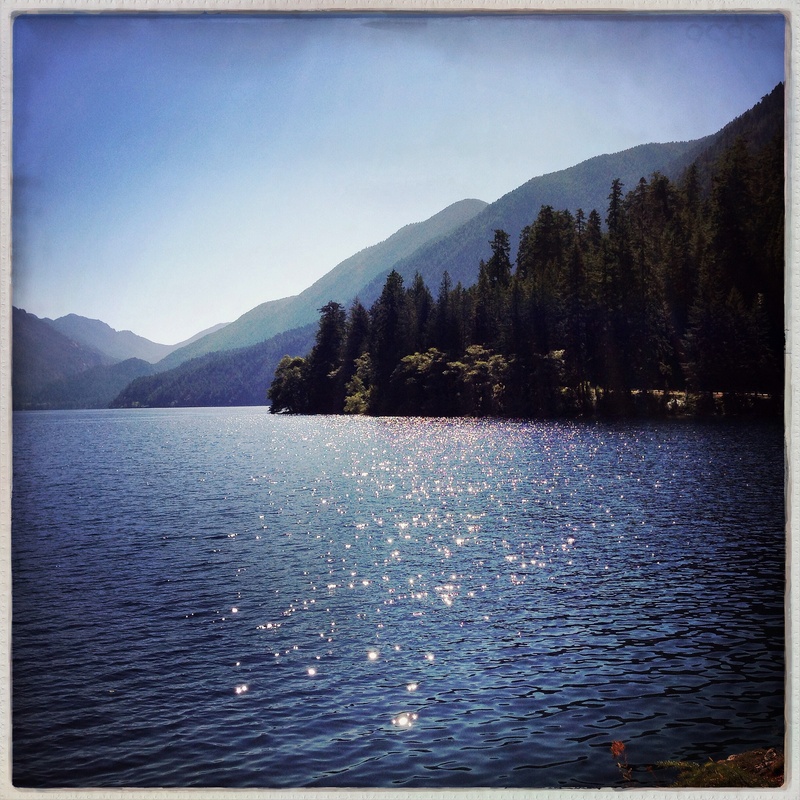 I have kayaking photos of Lake Crescent from couple of weeks ago. We stayed at Fairholme for four nights. Lovely location. Wonderful image. Lisa. Magnificent! Love the perspective of this photo, and the lighting is perfect. Thanks, Jackie! This is one place I wished we had more time to spend just watching the water. I can totally see why you would want more time there. Oh, how I’d love to be there right now. Beautiful! I recognized this lake right away! Great picture! I love the different layers of hills in the background and the sparking water in front. A beautiful photo. Sparkling sun on water. Love it! Thanks, LD it is a lovely place. Reminds me of West Lake just outside of Prince George, BC. I’ve heard that is a beautiful area, Allan and I would think the lakes could share a similar geologic history. Am speechless at its serenity. Thank you. 🙂 This is a beautiful beach that is surprisingly quiet, serene is a good word to describe the feeling.